Drama. WPP PLC is a holding company (pronounced “whip”) and a world leader in providing communications services through dozens of operating companies (and familiar names and brands) in advertising, media investment management, consumer insight, public relations & public affairs, branding & identity, healthcare communications, direct, digital, promotion & relationship marketing, and specialist communications – fields that barely existed twenty years ago and were still incubating in the 90’s (The Associated Press, July 9, 2013, NY’s World Trade Center moves forward with major tenant, an ad company, in new skyscraper). Last year’s sales were about $17 billion which are only a third of Google’s $51 billion. But Google doesn’t design or make the ads or detail the creative content and business connections; companies like WPP do and Google presents them as do many other media companies. The company is 96% owned by institutions and pays a current dividend of $2.93 per year or $740 million (which is more than half its net income after tax) to its shareholders for a current yield of 3.4%. On the other hand, Google pays nothing even though its earnings per share are three times that of WPP. And so on. There are many points of comparison, and differences, that don’t add up, and not much that looks like an old bricks & mortar, inventory, markets, and management issues company familiar to the pundits of yesteryear. So we ask only one question: is our investment in the stock of WPP as “good as cash” and “better than money”. Or, equivalently, does our investment guarantee 100% capital safety and a hopeful – but not necessarily guaranteed – return above the rate of inflation? In our view, investors who want more than that – more than capital safety and a hopeful return above the rate of inflation – are just reading the funny pages and don’t know anything about “investing” but maybe a lot about “gambling“. 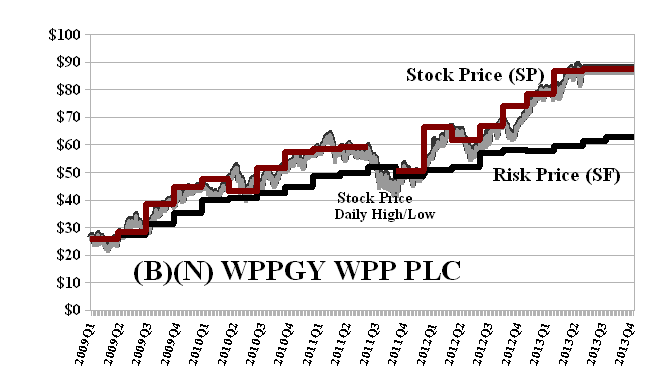 WPP became eligible for the Perpetual Bond™ at $30 in 2009 and has been in the Perpetual Bond™ more or less continuously through the current $87 well above the current Risk Price (SF) of $63 and rising. Please see Exhibit 1 below, Red Line Stock Price (SP) above the Black Line Risk Price (SF) and for no other reason. We were (and expect to be) occasionally sold out of our position on a stop/loss (such as in 2011 or 2012) but are usually glad to just take our profits and buy back in at a lower price as long as the company’s stock is still trading at or above the price of risk. The demonstrated downside risk in the stock price is currently minus ($7.50) per share so that we would not be surprised by any price between the current $87 and $80 to $95. We can also protect our price by buying the August put at $85 for $2.30 today, and partially offsetting the cost of that by selling the August call at $90 for $2.15 today, so that for the cost of holding the stock at $87 and the collar at $0.15 per share ($2.30 less $2.15), we’re assured of $85 to $90 for the stock until mid-August and can re-visit the situation then. These are dangerous times with few signposts for investment success. For more on what our “no spin” analysis is doing for us, please visit our Post at The Wall Street “Spin” For Sale, June 2013. WPP PLC is a communications services organization offering national and multinational clients a comprehensive communications services. It operates in the UK, Central and Eastern Europe, the Middle East, Africa, Australia, US, and Asia. From the Company: WPP plc provides communications services worldwide. Its Advertising and Media Investment Management segment plans and creates marketing and branding campaigns; and designs and produces advertisements for television, cable, the Internet, radio, magazines, and newspapers, as well as outdoor locations, including billboards. This segment also has media investment management capabilities in the areas of business science, consumer insight, communications and media planning implementation, interactions, content development, and sports and entertainment marketing. The companys Consumer Insight segment offers custom research services in various sectors, including strategic market studies; brand positioning; equity research; customer satisfaction surveys; product development; international research; advanced modeling; advertising research; pre-testing, tracking, and sales modeling; and trends and futures research and consultancy. Its Public Relations & Public Affairs segment provides advice to clients that seek to communicate with consumers, governments, and/or the business and financial communities. This segments activities include corporate, financial, and marketing communications; crisis management; reputation management; public affairs; and government lobbying. The companys Branding & Identity, Healthcare, and Specialist Communications segment engages in branding and identity; healthcare communications; and direct, digital, promotional, and relationship marketing activities. This segment also offers specialist communications services, such as custom media and multicultural marketing; event, sports, youth, and entertainment marketing; corporate and business-to-business; and media, technology, and production services, as well as digital and measurable interactive marketing, digital marketing strategy, mobile solutions, and platforms services. The company has a strategic partnership with Twitter, Inc. WPP plc was founded in 1971, has 116,000 employees, and is based in London, the United Kingdom.